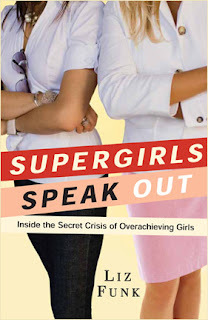 As I promised yesterday, in my interview post with author Liz Funk, here's your chance to win a free copy of Liz's book, Supergirls Speak Out: Inside the Secret Crisis of Overachieving Girls . In the interest of full disclosure, the copy I'm offering is my review copy, sent to me by Liz's publisher. Liz has given me permission to give it away and I was very careful with it while I was reading; for all intents and purposes, it's brand new. 2. Follow fourthwavefem on Twitter and send us an @reply indicating your interest in the contest. 3. Join the Fourth Wave Feminism group on Facebook and post a note on the Wall. That's all! Do one of these three things before Sunday, March 15, 5pm EST -- at that time, I'll draw a name at random from those who've entered the contest and will alert the winner! If you leave a comment on the blog itself (option #1), please make sure you either provide a valid email address or that you have contact details listed in your blogger profile, since, if you win, I'll need to get in touch about shipping details. Happy contesting. And look out for FWF contests in the future!